Quinta Branca is a renovated typical Portuguese house situated in a quiet area, yet just 5 Min away from all the main attractions - beaches, water slide parks, karting, marina, golf, tennis and main resorts - Vale do Lobo, Quinta do Lago, Quarteira, & Vilamoura. This house is set in a private property that is completely fenced in. Owners live in a small cottage next door. 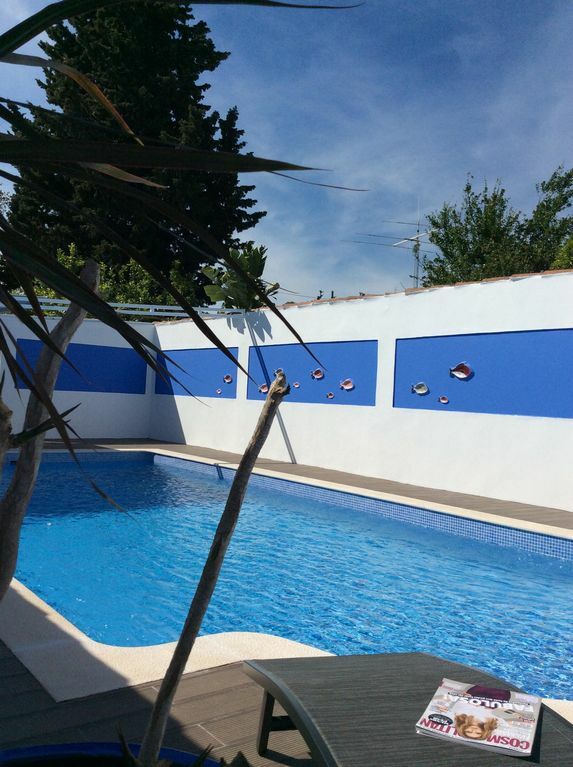 There is a private swimming pool completely walled in with a lockable door (very safe for smaller children) and great for total privacy. Villa facilities: Quinta Branca is tastefully furnished and equipped for your comfort with BBQ, private swimming pool, nice garden and sunning terrace. Services & safety: Maid service is twice a week, towels will be changed twice a week and bed linen is changed once a week. Beach & swimming pool towels are not supplied. The house is completely fenced in, and the swimming pool is completely walled in with a lockable door that brings safety for smaller children. traditional fish market, clothes & handicraft market are in Loule that is only 4 Km away. Beaches, golf & tennis and karting are only 3Km away. We have a good English doctor just 3 Km away and the main Hospital is in Faro - 12 Km away. Please note we do not provide pool/beach towels. There is a cot & high chair for the smaller ones available at no extra charge - must be requested on booking. There is air conditioning in the main bedroom and dinning/living room, and fans in other two bedrooms. PLEASE NOTE: Saturday change over. We meet all our clients at the airport. The house is beautiful with everything you need to make your stay a home from home. Stunning gardens, outside patio and a fantastic pool we used everyday. Relaxing in such splendid surroundings ensured the restful holiday we so wanted. We are happy to hear that you enjoyed your holiday at Quinta Branca. Thank you for looking after our home during your stay, you are always welcome. We had a very nice stay during our holiday. We will definitely come back next year !!. This was our third stay at Quinta Branca and it was perfect as always. I am just now writing this review having just booked again for 2014. The location is so convenient for everything in the Almancil area and yet it is a lovely countryside setting with peaceful garden and very private pool area. We are really looking forward to seeing the new floors Haley is putting in this winter which we are sure will make the house even more attractive. It is a true home from home place. We spent two wonderful weeks with our baby in this house. Nice beaches are a 10min drive from the house, the swimming pool is big and sunny. the house is very well equipped and always clean. We had a relaxing and lovely week at this secluded villa set in a rural location. It was very comfortable and well maintained. The pool was a bonus and the garden was great to unwind in. It is essential to have a car and the owner can assist with this, it is worthwhile booking the car at the same time as booking the villa. We were only minutes away from Almancil where there were three large supermarkets which catered for all our needs. The owner met us at the airport and took us to the villa which was an enormous help and much appreciated. We would have no hesitation recommending this; it was a special place to spend a holiday. Other Activities: Scuba divers - we arrange outings with or without equipment .